(Toronto, ON) – The sustainable mobility revolution is accessible to all Canadians, as Canada's first drivers from coast-to-coast are picking up the keys to their own all-new 2010 Toyota Prius – the tech-savvy third-generation evolution of the full-hybrid passenger car that started it all. Think you know who’s driving Prius hybrids these days? Think again! 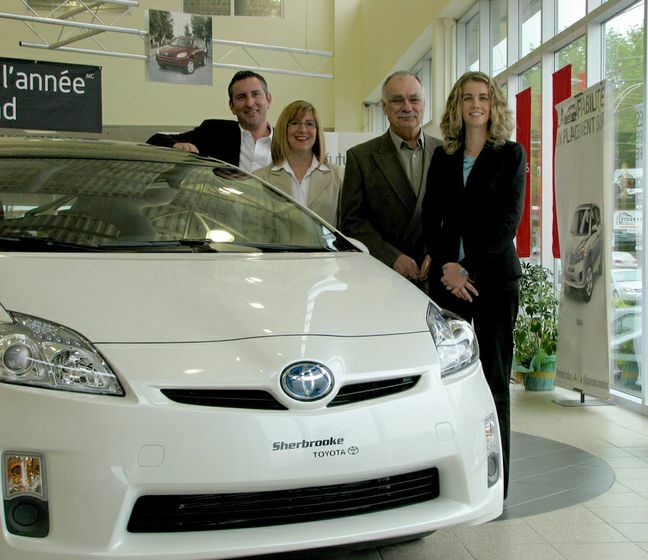 Actors, climate change presenters, driving instructors, civil servants and dairy farmers from across Canada are set to become the very first owners of the all-new, 3rd generation 2010 Toyota Prius, proving that this new hybrid really is for everyone. Loaded with innovation and featuring more than 1,000 patents, the 2010 Toyota Prius arrives at Canadian Toyota Dealers with an equally impressive price tag: starting at just $27,800, the next-generation Prius costs less than its 2009 model predecessor. Even more Canadians will find the world’s ambassador for environmentally responsible personal transportation a perfect choice for their lifestyle. 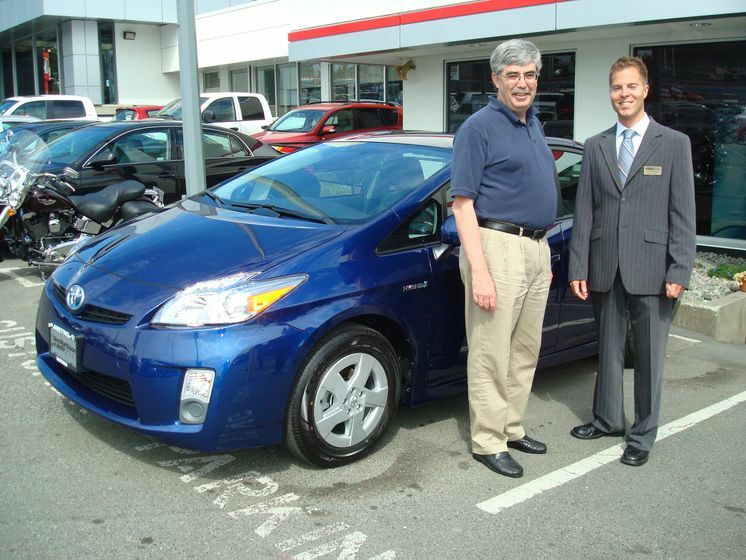 Andrew Macauley (Victoria BC): Andrew is a BC civil servant whose daughter convinced him to have a look at the new 2010 Toyota Prius. He’s concerned that society’s energy consumption is going to become a very real problem, and appreciates that the Prius has been designed from the ground up to minimize its fossil fuel consumption. “Why not just make the right decision today when the option is there? There’s no sense in putting it off when technologies like we see with the Prius hybrid are here today,” he says. Andrew is picking up his 2010 Prius from Metro Lexus Toyota. Kae Shummoogum (Calgary AB): Kae is a long-time hybrid vehicle enthusiast who has owned a Prius before, as well as a Toyota Camry Hybrid and Toyota Highlander Hybrid. The 2010 Prius will be the sixth hybrid his family has owned. While he has owned hybrids from other manufacturers, he loves the full-hybrid system from Toyota and plans to replace those with Toyota models in the future. Toyota’s hybrids are not only fuel efficient and generate fewer emissions in Kae’s personal life – they’re also critical to the work done by his two companies (Gasonic Instruments and EnviroRentals), which provide instruments and monitoring of air quality in buildings and parkades. “We’re always worried about the exhaust/emissions from our own vehicles, and the Prius and hybrids are the best ways to ensure we’re minimizing those emissions during our work,” he says. In addition, Kae has invested in solar water heaters and a wind power generator, and was trained by Al Gore to present a version of the former US Vice President’s “An Inconvenient Truth” presentation. Kae also incorporates his own personal experience with hybrid vehicles, solar energy and wind power during his presentations. Kae is picking up his 2010 Prius from Country Hills Toyota. Ron Rushbrook (Regina SK): Ron has been a Toyota owner for years, having previously driven a Camry and a RAV4, and is trading in his second generation 2006 Prius on the all-new model. “In my day to day activities, it’s important that I be as friendly as I can to the world we are living in,” he notes. Ron is also looking forward to the new Prius’ more powerful yet more efficient Hybrid Synergy Drive and the revised styling. “And of course, you can’t beat Toyota quality,” he says. Ron is picking up his 2010 Prius from Taylor Toyota. Angelo DiCiccio / Young Drivers of Canada (Markham ON): The trusted training company has been teaching Canadians how to drive and survive for more than 30 years, and has just celebrated the graduation of its one millionth student. Angelo is general manager of the company’s Greater Toronto Region and the new 2010 Toyota Prius will be his first hybrid. Angelo’s job puts him in the car a lot, and he’s always concerned about safety and fuel economy – two areas where the Prius excels, with Vehicle Stability Control, Traction Control, seven airbags, and Toyota’s Active Front Headrests with Whiplash Protection, plus best-in-class fuel efficiency. Add in Toyota’s legendary quality and the Prius is a winner in Angelo’s books. “The average in-car instructor will log about 50,000-60,000 kilometres a year, so – without a doubt – reliability and fuel efficiency are key,” he notes. Angelo is picking up his 2010 Prius from Markville Toyota. Jacques Thisdale (Sherbrooke QC): Jacques is a well known actor who has long believed that being environmentally responsible is an important way to live. He’s becoming a first-time hybrid owner after researching the fuel economy, low emissions and other benefits of the full hybrid system used in the Toyota Prius. He’s most excited about the potential that money saved on gasoline can be put to better uses for all of us. “The millions of dollars that people spend on gas is money not being directed into our cities, infrastructure and the environment. The Prius is one way to work towards preventing some of that waste,” he says. 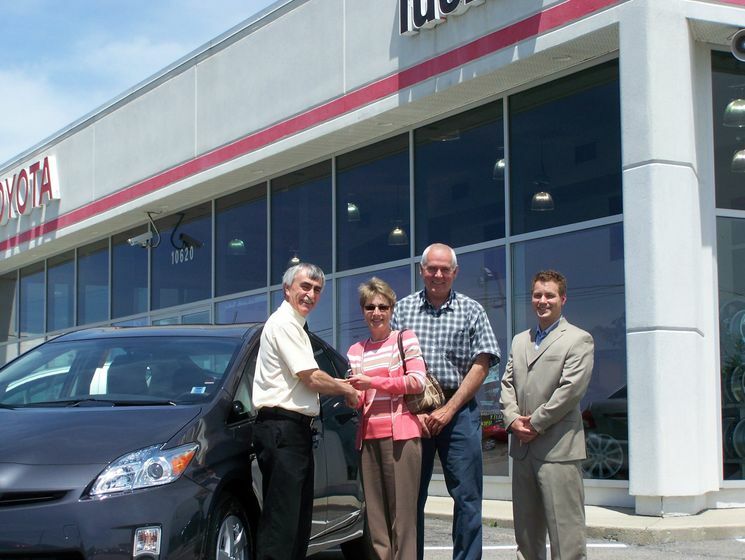 Jacques is collecting the keys to his 2010 Toyota Prius from Sherbrooke Toyota. Cory Cook (Yarmouth NS): Cory owns Cooks Dairy, a small independent company started by his grandfather more than eight decades ago. He likes the organization of the instruments and controls, and is excited about the available navigation system. He’s also concerned about the price of gas and the best-in-class fuel efficiency of the new Prius was a big selling point. This is his first hybrid. “My family has done its best to recycle and so on, but this is a big step for us into more environmentally aware living,” he says. Cory is picking up his Prius from Tusket Toyota. Joe Jacob (Moncton NB): Joe owns a fish processing business and is a car guy and big fan of hybrids. He has owned Toyotas exclusively since 1990, often buying more than one at a time, and this will be his fourth Prius. He’s very keen on the solar-powered cooling system, but for him, fuel efficiency is the bottom line. “I do a lot of short distance driving for my business, and hybrids are great at that. The Prius will save me money in the long run,” he says. Joe is collecting his keys from Acadia Toyota. Less money at the gas station, thanks to improved fuel consumption of an estimated 3.8 L / 100 km combined – the 2010 Prius is the only model on the road that beats the 2009 ecoENERGY award winner for Most Fuel-Efficient Mid-Size vehicle - the 2009 Prius. In fact, according to Transport Canada’s ecoENERGY Fuel Consumption Guide, the new 2010 Prius will be the most fuel-efficient on the road today. Less resistance, thanks to an aerodynamic body design that delivers Toyota’s best coefficient of drag (Cd) of 0.25, thereby improving fuel efficiency and reducing road noise. More comfort, from additional rear-seat legroom to Toyota’s first available solar-powered ventilation system that pre-cools the Prius cabin in summer. Less footprint, thanks to the new Prius’ ability to operate in electric-only mode, improved fuel efficiency, reduced emissions, and the use of environmentally-responsible manufacturing methods and materials, such as plant-derived, carbon neutral plastics and available LED headlights. The well-equipped 2010 Toyota Prius (MSRP starting at $27,800) is a versatile five-passenger liftback powered by a specially designed Toyota Hybrid Synergy Drive system that delivers up to 134 net horsepower from its gasoline engine and electric motor, plus a combined city/highway fuel efficiency of 3.8 L per 100 km and a Tier 2 Bin 3 emissions rating. This full-hybrid that started it all is capable of operating in electric-only mode in addition to gas only and gas-electric combination, the 2010 Prius captures and stores energy through a regenerative braking system and comes standard-equipped with innovative features such as the Eco Driver monitor; an automatic temperature control system; high solar energy absorbing window glass with UV protection; the Toyota Smart Key system with driver door-handle touch sensor for locking/unlocking and push-button start; Toyota’s active front headrests with whiplash protection; efficient, high-visibility LED brakelamps; and more. Those looking for additional features can order the 2010 Toyota Prius Premium Package (MSRP starting at $30,045), which adds an upgraded JBL Audio system with Bluetooth capability, integrated XM Satellite Radio, six-disc CD changer and eight speakers; an integrated garage door opener; driver and front passenger footwell lamps; a front passenger door-handle touch sensor for locking/unlocking; and an auto-dimming rear view mirrors with integrated backup camera. Climbing into a hot car at the height of summer is never comfortable – at least, until now. The 2010 Toyota Prius Premium Package with Solar Panel (MSRP starting at $31,635) includes the same added features as the Premium Package, plus a power moon roof equipped with solar cells and remote air conditioning system that pre-cools the cabin and keeps it comfortable – even when the Prius is parked. Those using their Prius for daily commutes or long drives will enjoy the 2010 Toyota Prius Touring Package (MSRP starting at $31,865), which maximizes comfort and drivability with a special suite of features, including: a premium JBL Audio system featuring a six-disc CD changer, eight speakers, integrated XM Satellite Radio capability, and Bluetooth capability; integrated garage door opener; driver and front passenger footwell lamps and illuminated doorsill trim; a front passenger door-handle touch sensor for locking/unlocking; an auto-dimming rear view mirrors with integrated backup camera; LED headlamps with the Toyota Auto-levelling Headlamp System, headlamp washers and fog lamps; and larger, P215/45R17 tires on 17” aluminum alloy wheels. The 2010 Toyota Prius Technology Package (MSRP starting at $37,395) delivers maximum FutureWow benefits by building on the Premium Package with Solar Panel. Additional features include: water repellent front door glass; a voice-activated DVD navigation system with backup camera; the Toyota Intelligent Parking Assist system; Dynamic radar cruise control and Toyota’s Pre-Collision System. The whole is wrapped in additional comfort and style, including: Leather seat surfaces; Heated front seats; Leather-wrapped steering wheel; Auto-dimming rear-view mirror; and front illuminated doorsill trim.